Moss on your roof can be a common occurrence, especially during rainy, humid weather. While moss may seem harmless, it can actually cause serious damage to your roof. Moss is a plant that thrives in wet environments and can grow just about anywhere. When its spores become airborne, they often land on roofs and collect in the spaces between shingles. Moss will grow the most in areas of the roof that are shaded and/or do not receive much sun exposure. If these areas are not dried out, the moss will soak up the rainwater like a sponge. What Does Moss Do to Roofs? Because of all the moisture it holds, moss can cause mold and decay. Depending on the severity of the moss growth, the damage could even affect the structure of your house or cause leaks, which can lead to mold and decay inside the home. From major roof issues to cosmetic repairs, treating moss on your roof can be extensive and costly if left unchecked. How Can I Get Rid of Moss On My Roof? 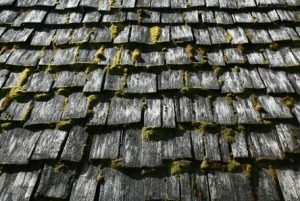 There are several methods for removing moss from your roof. If your moss issue is not severe, you can try using a brush or broom to remove it. If you have a more significant amount of growth, you can try installing zinc or copper flashing, which dissolves in the rain and kills the moss. The best way to assess and treat moss on your roof, however, is to contact a professional. If you’re in East Stroudsburg, Pennsylvania, enlist the help of your neighborhood experts at Roofing by Bruce. From inspections to installations, Roofing by Bruce can handle any of your roofing needs. Contact us today!